Adventure Company is a party-based action RPG developed by Foursaken Media, the guys behind War Tortoise. The game revolves around the adventures of a treasure-hunting company out on a hunt for rare and mysterious artifacts. As the owner of a company, your duty is to recruit trainees, explore locations, fight enemies and collect relics. Your company’s sponsors will give you rewards for the artifacts you have discovered. You must keep recruiting trainees not only to vanquish a stronger foe in a boss battle, but also for stages that contain more than one location. In such stages, you will have to drop at least one character on each location and having more recruits will allow you to deploy more characters to every location, which make it easier for you to complete objectives in each location. If there’s only one location to explore, then you can send all characters that you have recruited so far. However, the experience you will gain after winning the battle will be split among all characters evenly. The more characters you will deploy to one location, the fewer EXP each of them will acquire. Fallen fighters, farmers and other classes in your squad will still earn the same amount of EXP as others, so don’t worry if they get killed during the battle. The characters you deploy gain EXP, which fills their star. Once a character gets a star he becomes a one/two/three/four/five star trainee. A new skill is earned when a new recruit becomes a one, two, three and five star trainee. Make the most of your character’s skills and use them at crucial moments. The characters that fight automatically may also use skills occasionally, so you don’t need to worry about them. Just focus on your character whom you are controlling. You will have to spend coins to purchase a new fighter. In case you are not happy with the current fighter list, you can always get a new list of recruits by tapping the “Refresh” button, which will let you watch an advert for a few seconds. If you have deployed multiple fighters to a location, you can control only one fighter while the others enters auto-battle mode. To switch between fighters, tap the green button to your right or press the fighter icon located at the bottom of the screen. One advantage of deploying all characters to one location is that the battle, especially if it’s a boss battle, can be won easily and chances of completing a bonus objective are more. Enemies can be killed at a faster rate as all characters except the one you are controlling will automatically kill incoming enemies. Just make sure that you have trained them and equipped the best weapons to them before deploying them to a location. The friendly AI is pretty smart, so your squad members will also hunt and collect artifacts or form a group when battling a boss monster. Try to move with your team when battling bosses. Bosses are hard to beat and you will have to keep attacking him to drain his HP faster. Your team will automatically attack the boss and any incoming enemy. Be with them and use your special skills from time to time while attacking. Change your attack tactics according to a location’s objective/bonus objective. For objectives that tell you to kill an “X” number of enemies or survive without taking damage, select the strongest character in your team and choose a safer spot where fewer enemies appear while your squad members spread out, killing incoming enemies/collect artifacts. You may just stand in one area and start killing any enemy that respawns in that area. Just make sure you avoid getting hit by archers by moving away from arrows. You can also keep moving and avoiding any encounters with tougher enemies. 3. Collect Artifacts to Get Gems and Maybe a Rare Item! Like your company, there are several companies hunting for artifacts. When you collect relics, you get trophies. Keep collecting trophies to reach the top rank and you may get a rare weapon along with gems. For each relic you collect and send to your “sponsors” (yes you are a treasure hunter and your company is sponsored by those who want those artifacts), you get one gem. Tap the trophy icon on you map to see the current standings. The rewards that you will receive will rely on your rank at the end of the day. Higher ranked companies stand a chance to receive better weapons. So keep collecting artifacts and earn trophies to get to a higher rank. Collect artifacts scattered all around a location. They appear randomly. Keep an eye on those stages with objectives centered on artifacts. You may replay those objectives; however the number of trophies you will receive will be far lesser than the trophies you got on first attempt. Bonus missions also contain artifacts and bags of gems. A new bonus mission appears every few hours, so when you complete one you won’t get another instantly. You can also try endless mission where enemies keep appearing over time and all you have to do is hunt and collect treasures before your squad gets defeated. This stage usually contains gems, although chances of stumbling upon an artifact cannot be ruled out. Keep an eye on such “endless” stages as they don’t have timers and can be attempted any time once you are ready with your squad. Before deploying, you can experiment by building different teams and class combinations. 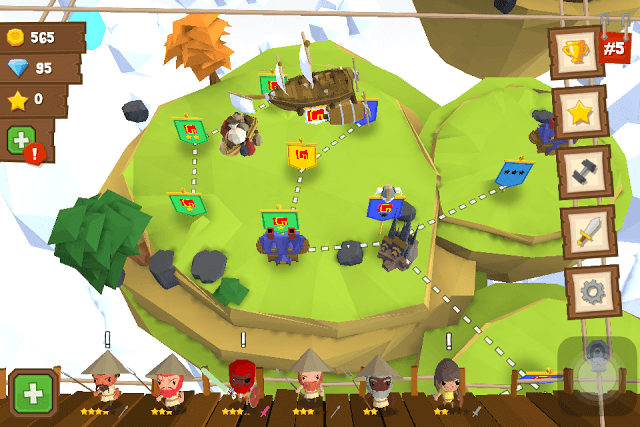 For starters, you can have a team consisting of a long range unit like an archers, apprentice and fighter/farmer for each location. 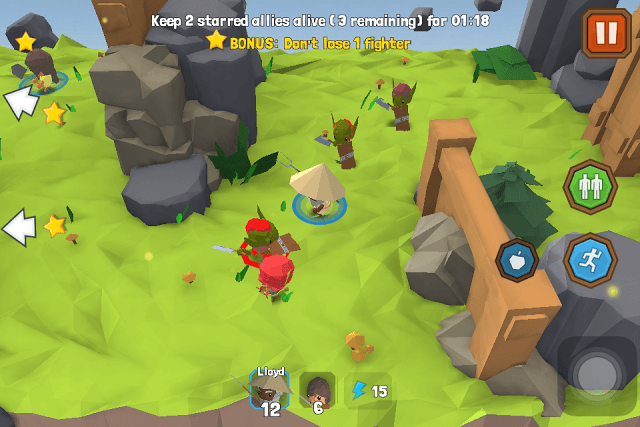 Melee characters in your team can keep incoming enemies busy while your archer can kill them from a distance. The recruitment center usually contains “trainees”, which can later be promoted to a new class (farmer, fighter, apprentice and lumberjack). Most trainees belong to the fighter class, but you may find farmer, lumberjack or archer class characters also. You can press the refresh button to watch an advert to get a new list and there might be an archer or some other class. Sometimes, a rare class may also appear in the recruitment list, but such characters can only be purchased with gems. A character first needs to gain certain number of stars before it can be promoted to a new class. The star(s) that a character acquires is different from the star you gain after a bonus objective is completed. The EXP a character gains after each battle fills a star slowly and once full, he acquires a new star. A 2 and 3 star character can be promoted to a new class, but make sure you have a suitable weapon for that class. Promoting a character costs gems. Promotion also increases certain stats like HP, ATK, DEF, EDF, SPD. Before doing anything, take a look at the stats that will be improved after promoting a character. The stats that can be improved will have bars shown in light green color. You get a star when you complete a bonus objective. This star can be used to unlock upgrades, such as faster mana regeneration, extra coins, extra experience and other perks. You can replay previous stages where you failed to complete a bonus objective. However, you won’t get a star in stages where you have already completed a bonus objective. Yes you can play that stage again for extra gold, but the bonus quest will be locked. On the world map, stages with completed bonus quests are shown in green, whereas those in blue stages where the player could not complete one. Dual Stick: Lets you control and move a fighter with the left virtual analog stick and press the right button to auto aim and attack. One Stick: Best control mode. You just need to use the left analog stick to move your selected character while he automatically attacks nearby enemies. One hand: Press anywhere on the screen to move while your character automatically attacks nearby enemies. So you have closed the app because you are going to sleep or having a busy schedule. Why not train your characters while you are away. When you come back, you will see your squad members have earned free experience over time and maybe some have even got a star. Tap the training icon on the world map and add up to 3 characters. You can choose those who haven’t received a star yet or who have got a few stars compared to others. Getting XP by training characters can be slower than earning EXP battling enemies. However, there’s a way to speed up training – watch an advert to get x4 training boost or spend 500/1000 coins for a x10/x20 training boost. Select the best weapons for your characters, but bear in mind that each character class can be equipped with appropriate weapon. Farmers and spearmen can be equipped with spears. Fighters and swordsman can be equipped with swords and daggers. Apprentices can be equipped with staff and the Lumberjack class can be equipped with a hammer. You might receive a rare weapon when you complete boss stage. You may also get better weapons based on the rank you have reached. And if you are impatient then there’s always the shop (sword icon) where you can purchase a new weapon for your character. The shop will show a set of weapons. To get a new set, tap the “Restock” icon and watch a short advert. Common weapons usually boost your character’s stat (DEF, ATK HP, EDF and SPD). For example the Hammer of Protection provides an extra point to your Lumberjack character’s Defense.